Sergio Ramos lit the blue touch paper for this year’s Champions League by taking a swipe at the star player of the team that will host the final next June. Ramos went for Atletico Madrid‘s Antoine Griezmann in his media conference ahead of Wednesday’s first group game with Roma, suggesting the player was ‘ignorant’ and hinting that he believed he was lacking respect for other top players. Ramos was asked: ‘What do you think about Griezmann saying he now eats at the same table as [Lionel] Messi and [Cristiano] Ronaldo? He replied with a Spanish refrain: ‘Ignorance is always bold’. IS THIS WHY RAMOS HAS IT IN FOR GRIEZMANN? Ramos attack on Griezmann may have more to do with something he did after the Uefa Super Cup final than his more recent comments about Messi and Ronaldo. 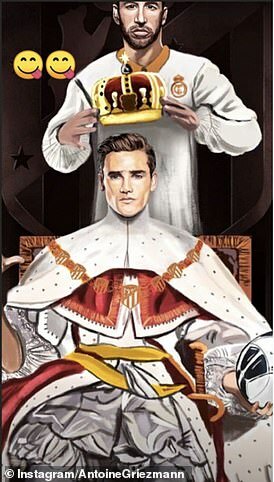 After Atletico Madrid beat Real Madrid in Estonia in August Griezmann posted an illustration on his Instagram account of Ramos placing a crown on Griezmann’s head. It symbolized an apparent power shift in the Spanish capital. It clearly also wound up Ramos. Griezmann has been vocal in his criticism of the recent list of candidates for the Fifa The Best awards. He was absent from the final three with Cristiano Ronaldo, Luka Modric and Mohamed Sala all contesting the prize. In an interview with Diario AS this week he said: ‘It’s a Fifa prize and it is a shame that no World Cup winner is nominated. ‘I think the Balon d’Or carries more prestige and more history. 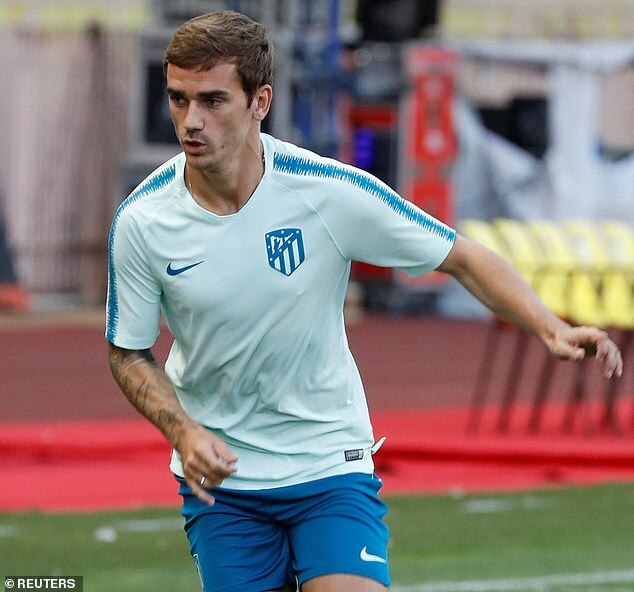 Griezmann’s comment about Messi and Ronaldo was actually prompted by the question. ‘Yes I think so. And I know other players are going to arrive too. Despite the tone of the answer in context Monday’s front page of Diario AS carried: ‘I know I eat at the same table as Messi and Ronaldo’ as its headline. Ramos was merciless in bringing down the French forward. The Real Madrid captain added: ‘He ought to let Cholo [Simeone] or [Diego] Godin or Koke advise him. ‘These are people that have certain values that would do him good. Real Madrid have now been Champions of Europe for 845 days. If they are to win a fourth straight European Cup they will do it at the home of their great city rivals and the home of Griezmann. Ramos also took a minor pop at Cristiano Ronaldo, suggesting that he agreed with the assertion of Roma coach Eusebio Di Francesco that Real Madrid have gained in certain aspects without the player. Ramos said: ‘Cris gave us many things but he took other things away [from our game]. Not many things, but certain things.